gave rubies their red color. of the buried terracotta army. after the Greek word for color. at least they were shiny. 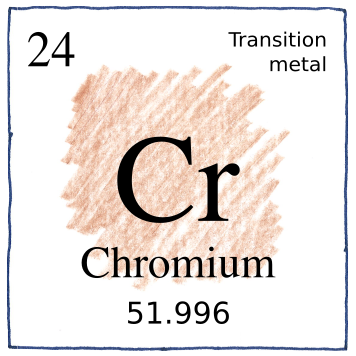 Trivalent chromium has been deemed to be an essential trace element, but lack of proof suggests that it is merely benign. It isn’t necessary for anyone to take chromium supplements who eats food prepared in stainless steel cookware, and those who are allergic to chromium or nickel are advised to cook with aluminum, enameled, or cast iron cookware.